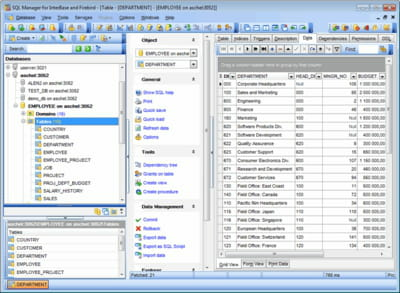 EMS SQL IB/FB Manager is a software used for the administration and the development of InterBase and FireBird database. It has many features such as table data management, query building and many more. Managing: The software has a Unique support editors' function to manage InterBase and FireBird objects. It is also possible to rename or duplicate these objects and sub-objects in the tables like foreign keys or fields. 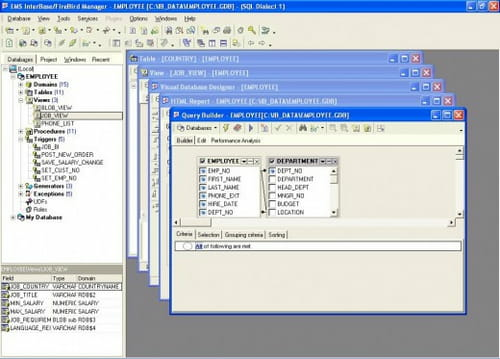 Data export: EMS SQL IB/FB Manager offers the possibility to extract some elements of the database and save them in different files. Among the output formats are PDF, TXT or CSV. Exporting data to MS Access is also doable. Query: The user can build complicated queries thanks to the visual query builder with the Unicode support. He can also see the query plans in the form of a diagram or edit the syntax by highlighting it. The software's graphical interface makes it easy to manipulate. It is available both in English and Russian. This is a trial version of EMS SQL IB/FB Manager. Latest update on June 22, 2015 at 10:47 AM.